Excerpt from Wirecutter -- "A study by researchers at the NYU Stern School of Business found that coupons for higher-priced items induce people to spend more money than they would otherwise. The study’s authors attribute the effect to 'reference-dependent gain,' where you think you’re getting a deal because you’re saving 5% on the cost of a nice meal, even if you wouldn’t have bought that meal otherwise. You might save $5 on a fancy $100 steak dinner, but you could have just spent $5 on ingredients to cook at home—and not spent that extra $95 at all." On Wednesday, April 3, the NYU Stern Center for Business and Human Rights will host a discussion entitled, "Online Advertising, Human Rights and the Rule of Law." The conversation will consider the human rights implications of current online advertising practices, and how advertisers, internet platforms and advertising companies can be expected to address these risks. Excerpt from ReachX Podcast -- "I believe we are still in a benign credit cycle, and we have been, actually, for over eight years—we're into the ninth year—which is the longest in the history of modern financial markets. Low default rates, high recovery rates if there are defaults, low interest rates and required rates of return for investors, and, finally, high liquidity. Those are the four metrics I look at. So, we're in a benign cycle, and we'll probably remain there for at least another year. My concerns are beyond that period, based on the enormous build up in debt, globally and particularly in the US markets." Excerpt from China Daily -- "Michael Spence, a professor at New York University and a Nobel laureate in economics, said the Chinese economy will 'slow a bit' this year amid the slowing global economy and trade frictions. 'And I think the reforms, which have been announced, are serious reforms, ... helping get rid of at least a component of the trade frictions,' Spence said on March 23 at the University of International Business and Economics in Beijing." Excerpt from GreenBiz -- "Sustainable Share Index (NYU Stern's Center for Sustainable Business) finds that sustainability-marketed products delivered 50.1 percent of market growth in consumer packaged goods (CPG) from 2013 to 2018, while representing 16.6 percent of the CPG market in dollar sales in 2018 — up from 14.3 percent in 2013." Excerpt from the Unchained podcast -- "...there’s no shame in saying, hey, you know, we’ve been around as a regulator since the 1930s. A few things have changed since then. We might want to, you know, just ask a few questions about whether the framework’s working the way it should, and if it’s not, let’s change it so that everyone’s better off and everyone has more freedom to make their own decisions and to do things that allow them to participate better in society, to contribute their talents and their resources to society." Excerpt from Forbes -- "She described the source of her seeming support or at least open attitude to the crypto industry, especially compared to the other SEC commissioners. 'I really identify with some of what’s driving people in this space, which is a desire to look at the world with fresh eyes and say, are there things we can do things better?' she said." New York University’s Stern School of Business today announced the appointment of alumnus Andre J.L. Koo (MBA '94), Chairman, Chailease Group, as Chair of the School’s Board of Overseers, effective July 1, 2019. Andre Koo is the first internationally-based business leader to serve in this position. On Tuesday, April 2, NYU Stern's Department of Accounting, Stern Accounting Society, Business Analytics Club and Beta Alpha Psi will welcome Chuck Saia, risk and financial advisory CEO of Deloitte, for a discussion on how to leverage innovation and technology to help clients embrace complexity and accelerate performance. The NYU Stern Salomon Center for the Study of Financial Institutions and the Bank Policy Institute will host the latest installment of the Gallatin Lecture Series on Banking on Tuesday, April 2. Excerpt from Bloomberg -- "I think you saw on Friday that the markets have entered into—or that Lyft's shareholders entered into—consensual hallucination with management that this company garners anything resembling this valuation." Excerpt from NPR -- "There's a wonderful body of literature these days led by Jonathan Haidt who teaches at New York University about 'moral foundations.' What he finds is that everybody in society basically shares two moral foundations: We all care about compassion, and we all care about fairness. We don't define those things in the same way, but we care about those things." Excerpt from Channel News Asia -- "The dramatic increase in use of social media and digital media for conversations helps these small niche products where people are very passionate about whatever that product area is." Excerpt from The Guardian -- "Deaths in Bangladesh’s garment sector have fallen in the past five years since the accord was introduced from about 71 a year to 17, according to research from New York University’s Stern Centre." Excerpt from National Geographic -- "To track how metropolitan regions have developed, Shlomo Angel and his colleagues at New York University used historical maps and satellite imagery to create the Atlas of Urban Expansion. The atlas defines city parameters to include the entire built area beyond a city’s jurisdictional boundaries and into surrounding municipalities." On Monday, April 1 NYU Stern's Fubon Center for Technology, Business and Innovation will host a talk on “Demystifying AI and Machine Learning” by Dr. Pedro Domingos, author of The Master Algorithm: How the Quest for the Ultimate Learning Machine Will Remake Our World. Excerpt from Cointelegraph -- "'Generally, a person can sell their property, including a business that they may own,' Hinkes told Cointelegraph. 'While eBay maintains a list of restricted goods that cannot be sold on its platform, it appears that there are specific areas on eBay's website designed for the sale of businesses; and Sponsy is listed on a page that appears to allow the sale of web pages and internet companies.'" Excerpt from Ad Age India -- "As our digital and non-worlds continue to blend, we will need to be conscious of designing for an inclusive world. This is extremely important from both, a business perspective as well as a consumer perspective. The discussion has only just begun." Excerpt from CNN -- "'The driver is the face of the brand,' he said. 'The entire experience is controlled by the person whose car you get into -- if they're projecting, "I'm underpaid and unhappy," that's not going to be a good experience.'" Excerpt from Forbes -- "The best marketers have not only figured out what it takes to stay relevant, they are motivated by the challenge. It was about this topic that I had the privilege of talking to Wendy Clark, CEO of DDB, Ann Lewnes, Executive Vice President and Chief Marketing Officer of Adobe, and Keith Weed, Chief Marketing and Communications Officer of Unilever, who will be inducted at an event on April 16 in New York into the 2019 AMA New York Marketing Hall of Fame." Excerpt from Fox Business -- "'What Lyft and Uber are right now is an incredible transfer of wealth from drivers to riders,' he said. 'I would argue that these companies have figured out the ultimate ninja move to kick the middle class in the groin by saying, "with 4,100 employees and our investors, we're going to split $25 billion and the 1.4 million drivers get between $8-$15 bucks an hour in flexibility."'" 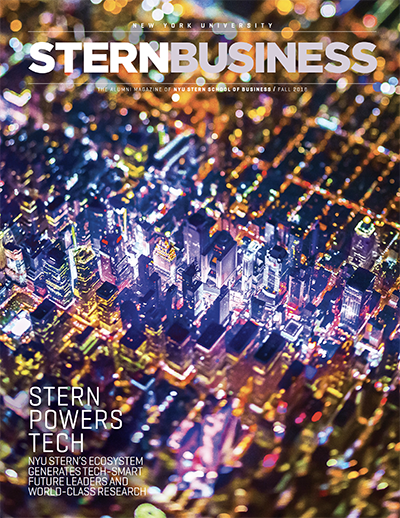 Excerpt from Forbes -- "'In particular, AT&T is finding itself short on leadership for Time Warner (in part because of losses due to leaders’ misconduct and subsequent resignations) and struggling to integrate very different corporate cultures, which is likely to encourage them to spin off businesses that are less likely strategically valuable to the combined entity,' explained NYU Stern professor Batia Wiesenfeld. ... 'My sense is that AT&T will not likely disrupt Warner Bros. Theatre Ventures at this point,' opined NYU Stern professor Paul Hardart." Excerpt from Bloomberg -- "'My own personal preference would be to go back to Europe and say, "we have a clear strategy, which is we want to leave without a deal, but we would like to take six months to complete the preparations to avoid the dislocation,"' King said. 'It depends on how far the preparations have got, and the government hasn’t been as explicit about that as they might.'" Excerpt from Retail Leader -- "The data is in and products with sustainable attributes are driving a disproportionate percentage of growth. IRI teamed with NYU’s Stern Center for Sustainable Business to understand why products with sustainability attributes driving superior growth rates." Excerpt from Gizmodo -- "While the major social networks have taken 'some steps' to counteract the spread of disinformation, a recent report from the NYU Stern Center for Business and Human Rights concluded that Facebook and, in particular, YouTube continue to employ 'a piecemeal approach' to the problem."